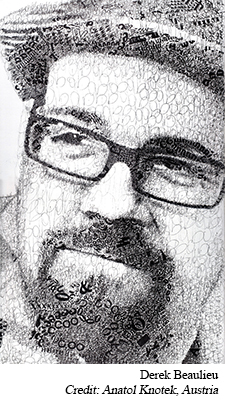 Derek Beaulieu is best known for his concrete poetry and other experimental writing that blends into conceptual art and thus has appeared in art galleries. A collection of his published work, Please, No More Poetry: the Poetry of Derek Beaulieu (2013) was edited by Kit Dobson. In addition to poetry Beaulieu has also published experimental novels and literary-art theory some of which was collected in Seen of the crime: Essays on conceptual writing (2011). He has also promoted the work of other writers and artists by editing their work. Of particular note is the anthology, Shift & Switch: New Canadian Poetry (2005) which he co-edited with Angela Rawlings and Jason Christie. In 2010 Beaulieu published How to Write, a collection of conceptual prose. See his extensive bibliography below which lists the many other book titles as well as work in anthologies, literary magazines and online. Beaulieu's work explores the relationships between writing, visual arts and forms of new media. His navigation into conceptual fiction is illustrated by his book, Local Colour (2008), a collection of coloured blocks inspired by the novella, Ghosts, by American writer Paul Auster. In Local Colour we find ghostly variations and a tension between the words and the images. Like his poetry his prose suggests that the words on the page can become art objects. Derek Beaulieu was appointed Poet Laureate of the City of Calgary from 2014–16, in recognition not only of his contributions to Canadian literature, but also of his community work in promoting the arts in Calgary. He has edited or co-edited the arts magazines filling Station (1998–2001, 2004–2008), daNDelion (2001–2004), and endNote (2000-2001). He founded housepress in 1997 which published literary works until 2004, and in 2005 established no press a small literary publisher. Derek Alexander Beaulieu was born in Montreal, Quebec in 1973 and grew up in Calgary, Alberta. He earned a B.A. (1994) in English and B.Ed (2008) and an M.A. from the University of Calgary. In 2014 he earned a Ph.D. in Creative Writing from Roehampton University, London, U.K. He has lectured and given readings across Canada, the US and Europe. Beaulieu has taught English and Creative Writing at Mount Royal University, the University of Calgary and the Alberta College of Art + Design.